UPPSALA, Sweden, April 7, 2014 (ENS) – Swedish scientists have developed a paper filter that can remove virus particles with a level of efficiency matching that of the best industrial virus filters. The paper filter consists of 100 percent high purity cellulose nanofibers, directly derived from nature, and is manufactured with traditional papermaking processes. Tiny virus particles, a thousand times thinner than a human hair, can only replicate in living cells, but once the cells become infected the viruses can turn out to be extremely pathogenic. Viruses can actively cause diseases on their own or can transform healthy cells to malignant tumors. “Viral contamination of biotechnological products is a serious challenge for production of therapeutic proteins and vaccines,” said Albert Mihranyan, associate professor at Uppsala University, who heads the study. “Because of their small size, virus removal is a non-trivial task. Therefore, inexpensive and robust virus removal filters are in high demand,” he said. 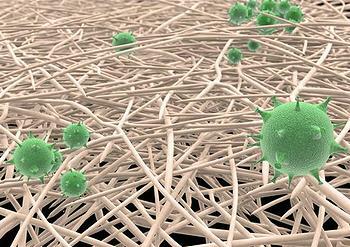 Cellulose, a component of green plants, is the most abundant organic polymer on Earth. It is one of the most common materials used to produce various types of filters because it is inexpensive, disposable, inert and non-toxic. Cellulose is also mechanically strong, stable in a wide range of acid and alkaline conditions, and can withstand sterilization in an autoclave. But normal filter paper, commonly used for chemistry, has pores that are too large to remove tiny viruses. The newly developed paper filter, which is made according to traditional papermaking processes, consists of 100 percent high purity cellulose nanofibers. Nanofibers have diameters less than 100 nanometers, a unit of measure equal to one billionth of a meter. By comparison, viruses range from 30-50 nanometers, so the nano-paper filter can serve as a virus barrier. The discovery is a result of a decade of research on the properties of high surface area nanocellulose materials, which enabled the scientists to tailor the pore size distribution of their paper precisely in the range desirable for virus filtration. Previously described virus removal paper filters relied heavily on interception of viruses via electrostatic interactions, which are sensitive to acid-base conditions and salt concentrations. Virus removal filters made from synthetic polymers, which rely on size exclusion, are produced through tedious multistep phase-inversion processing that involves hazardous solvents and rigorous heat treatment to control the pores of these materials. Uppsala University points to one of the most famous alumni, the Swedish chemist J.J. Berzelius (1779-1848), who was the first to use the pure wet-laid-all-rag paper for separation of precipitates in chemical analysis. To develop the nano-paper virus filter, Mihranyan collaborated with Uppsala Professor Maria Strømme and undergraduate student Linus Wågberg, and with virologists Dr. Giorgi Metreveli, Eva Emmoth, and Professor Sándor Belák from the Swedish University of Agricultural Sciences.